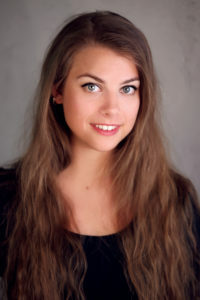 Swedish Coloratura Soprano Linnéa Sjösvärd graduated from the Opera Bachelor Program at the Academy of Music and Drama in Gothenburg in June 2018. During her studies Linnéa worked with roles such as Gilda in Rigoletto, Olympia in Les Contes d’Hoffmann, Morgana in Alcina and Gretel in Hänsel und Gretel. In summer 2018 Linnéa made her successful debut at Läckö Castle Opera as Janthe in Der Vampyr by H. Marschner. In 2017 she performed the lead role in Gone Fishing by R. Taylor at Gothenurg Opera and was soprano soloist in Carmina Burana at Gotheburg Concert Hall. In fall 2016 she debuted at the Royal Castle in Stockholm as Blondchen in Die Entfuhrung aus dem Serail by W.A. Mozart. On the concert platform Linnéa has participated in numerous concerts ranging from early baroque to modern music.